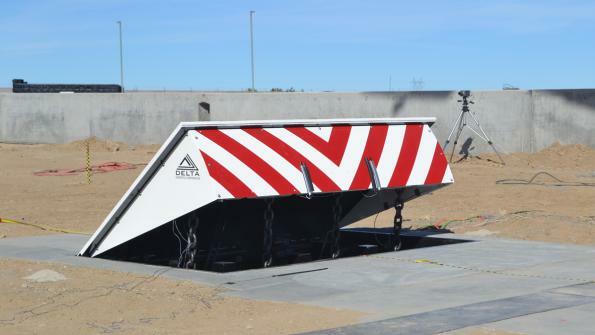 Delta Scientific’s HD300 barrier has successfully completed its M50 crash test. Delta Scientific’s HD300 barrier, available with either a fully electric or hydraulic control unit, will stop a 15,000-pound vehicle traveling 50 mph. Upon impact, the barrier remains in its foundation and the opening stays blocked, providing a multiple hit capability. In its M50 crash test, the HD300 completely disabled the test vehicle, causing severe damage to the occupant department and power train. The maximum penetration recorded was -1.8 meter on the passenger’s side. The P1 penetration rating was given because the penetration beyond the protected side of the barrier was less than 1.0 meter at the lower leading edge of the test vehicle’s cargo bed. The image to the left below shows the results of the test. With its 24-inch shallow foundation and pleasing design, the barrier eliminates the concerns of interference with buried pipes, power lines and fiber optic communication lines. The shallow foundation also reduces installation complexity, time, materials and corresponding costs. The product is suited for high water table locations and areas with corrosive soils. It offers low maintenance, as all components are accessible from the sides or top of the barrier. For increased security, the product leverages Delta’s proprietary counter-balanced technology to provide a 1.5 second emergency fast operation (EFO), responding to attacks very quickly. The electric actuator provides IP67 protection, meaning that the unit is totally protected against dust as well as the effect of immersion between 15 centimeters and 1 meter. In the video, see how the HD300 wedge barrier high security barricade stands up to vehicle impact.